Besides the CD storage itself (whose practical utility can be discussed), this item includes two nice pieces that will interest the Dylan books collectors. "The centrepiece of the set is the extremely sturdy hardcover LP ARTWORK BOOK. This is a 220-page chronological collection of full-size (12�) album artwork, which is beautifully and very accurately reproduced . The presentation features the front cover of each album, backed with the rear cover as you turn the page. Or, where there is a gatefold or other inserts in-between the original albums, these items are reproduced in their proper place. All artwork is included, even the full �Biograph� LP booklet. All of the artwork has been restored and the colours �cleaned-up� where necessary� as was done with the recent �Mono Box� set. The [other] item housed in the huge outer storage case is what the manufacture calls the Catalography. 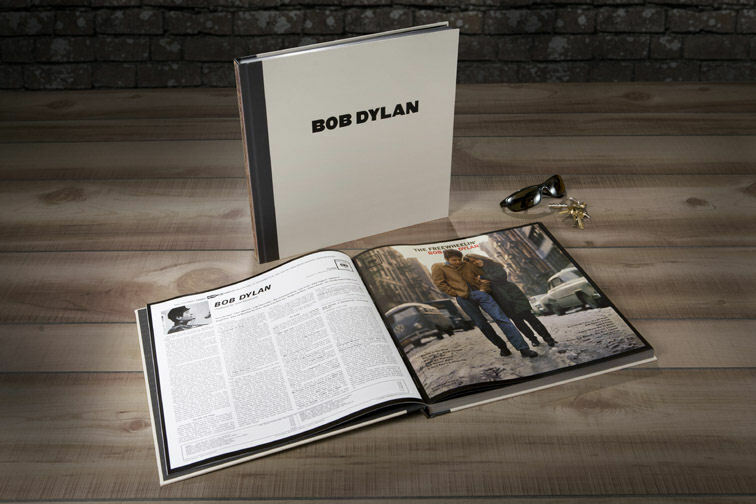 This 54-page large-format softback book is a full-colour journey through Dylan�s entire album catalogue, including excerpts from more than 90 album reviews, and 27 reproductions of album adverts".